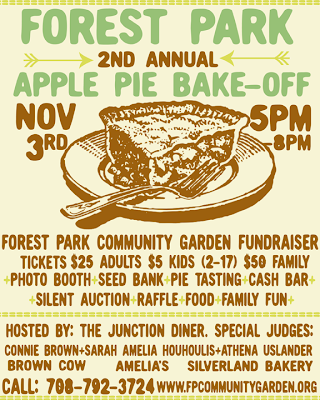 There's still time to get your ticket to attend or compete in the 2nd Annual Forest Park Apple Pie Bake-Off! Top 3 pies will receive a ribbon and a PieBox handcrafted right here in Chicago. Follow us on Facebook for updates on prizes and silent auction items. Want to attend/compete but prefer not to purchase ticket online? Call us at 708-792-3724.Enter contest and/or purchase tickets here. Kindly share this with your friends and family. 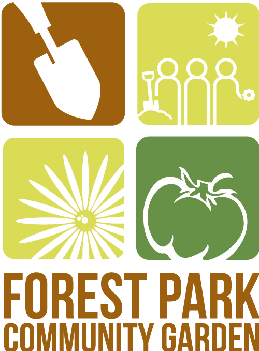 We rely on our annual fundraiser to raise enough money to operate the garden the following year which includes keeping our plot rental fees very low, paying for water used at the garden and all educational programs and member events throughout the year.